Now how to do this so it gets widespread but media doesent know about it =\. Also I would like to ad DONT WATCH TV TO THE LIST not my list but I support it. How to resized Image ??? I've done that for a long time. No its not anon Idea. This isn't to say they're actually DEAD though. 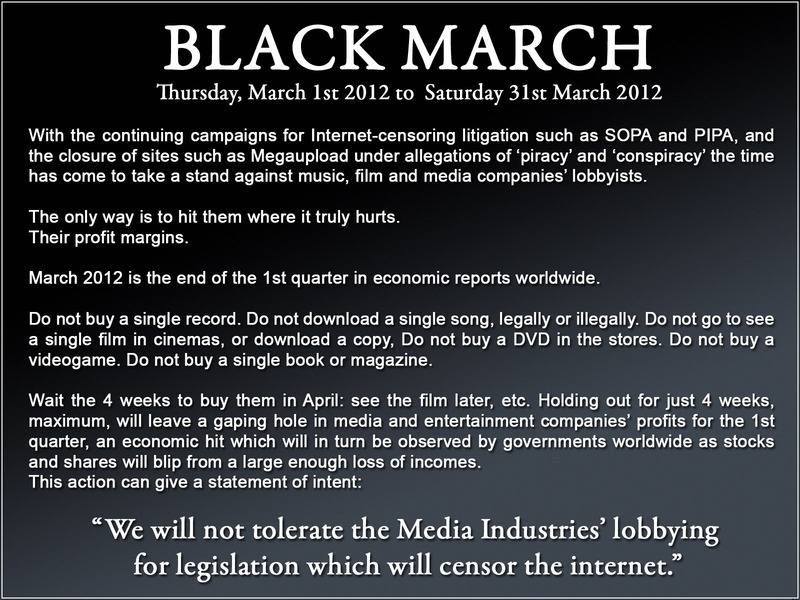 Black March might still be necessary. Still, a victory for public freedom of expression nonetheless. i don't watch crap from Hollywood anymore anyway. after watching 'Tokyo Drift' (legally), the F&F series is becoming damn diluted to me. Do not download a single song, legally or illegally. I don't see how refraining from piracy for a month will hurt the RIAA. I already don't spend any money on music, movies or games. That should be enough. So, sending ICE (Immigrations and Customs Enforcement) to shut down websites and hurling frivolous lawsuits at private individuals isn't harsh enough for our lawmakers. Until then, you should all look into the Virtual Private Networking technology that has existed for years. The Internets not so forgetting or forgiving.We are watching and waiting. This just in: Megavideo and Megaupload shut down retaliation by the Anonymous. ^ read that news article I found.